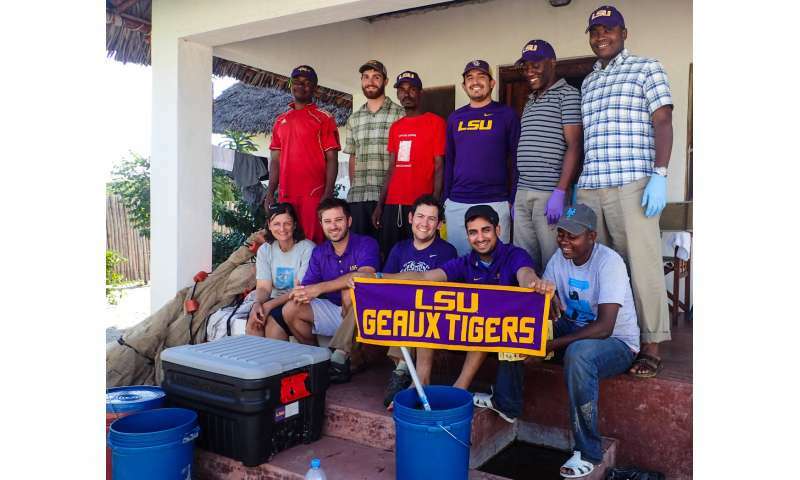 Louisiana State University is leveraging its expertise to improve coastal and environmental conditions in communities around the world. Experts are working to identify how small, coastal villages in the East African nation of Tanzania get caught in poverty traps, or mechanisms that cause poverty to persist in low-income communities. They are evaluating 13 different villages across the Pangani and Rufiji districts of Tanzania and analyzing the local mangrove ecosystems, including how humans influence and interact with these ecosystems. Researchers from the LSU College of the Coast & Environment, in collaboration with the University of Rhode Island, the University of Dar es Salaam, Florida International University, and Sea Sense, intend to create a predictive socio-ecological model that could determine the ecosystem-wide environmental and economic effects of fishing and deforesting in a given sector along the resource rich Tanzania coastline. While the other team members are focusing on the human systems piece of the puzzle, the LSU unit is analyzing the natural resources at play. Victor H. Rivera-Monroy, with his graduate student, Xiaochen Zhao, is studying the distribution of mangroves in wetlands and factors that regulate their ecosystem services, or how they benefit humans. 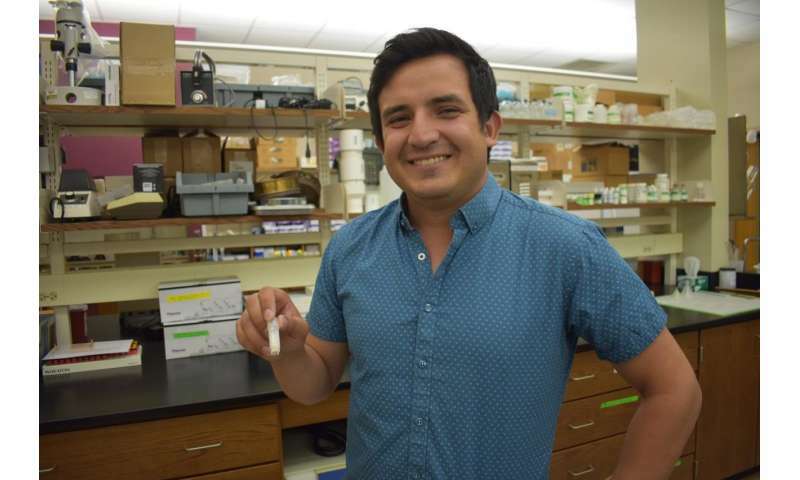 Steve Midway and Michael Polito, along with their respective graduate students Matt Robertson and Mario Hernandez, are researching the local fish ecology and fisheries. Robert Rohli is examining how climate variability and change are linked to the local hydrology and resulting ecosystem productivity. According to Rivera-Monroy, mangrove ecosystems are critical to the livelihoods of the coastal poor and provide a number of ecosystem services for humans such as providing a habitat for commercially valuable fish and other species, protecting coastal villages from flooding and storm surge, improving water quality, and absorbing carbon dioxide (a greenhouse gas) from the atmosphere. He says more than 35 percent of mangrove areas worldwide have degraded or been lost entirely in the past two decades, and most of those mangrove systems are located in developing countries. Rivera-Monroy and Zhao are measuring the mangrove forest structure, species diversity, and current surface area in and around these Tanzanian villages and analyzing the natural and human influences on its reduction in size over the last 20 years. "One of the most conspicuous impacts we detected in this coastal area is the illegal extraction of wood," Rivera-Monroy said. "We were surprised by how some of the mangrove forest species are targeted in small patches, but they add up to the total area being deforested on a large scale." Midway and Robertson are collecting fish catch data provided by the local villages' Beach Management Units (BMUs) such as: methods used to catch fish, how many fish are caught, and the types of fish locals are catching. While the BMUs having been collecting this data for some time, this is the first time anyone attempted to analyze and synthesize their statistics and their utility in coastal management plans. Robertson recently published this work in the journal Ocean & Coastal Management. Tanzania currently manages fisheries based on nationwide statistics, meaning blanket regulations for villages that use a variety of gear and catch a variety of species. Midway believes that in order to optimize fisheries management, Tanzanian officials need to be responsive to differences between regions. Midway plans to provide them with his research findings with the hope that they will improve regulations by adapting to that regional data. "These fishermen are catching anything they can, including fish that are [very small]. That's not usually something that happens in more developed areas [because] we are more regulated. This is what you get when you have fished all the big ones down," Midway said. In conjunction with overfishing, the tools and methods used by some Tanzanian fishermen to catch fish are harmful to fish habitats. "We've seen multiple groups of men pulling these 300-meter trawls through seagrass habitats. They're dragging nets to catch these fish and I have not seen them catch anything larger than maybe a foot. You can see in the net that there are shards of coral all over the place, loads of seagrass, and fish that are not mature at all. It's really unfortunate," Hernandez said. When fishermen drag these large nets through the sea grass habitats, they are destroying the habitat that juvenile fishes need to grow and reproduce, reducing the fish population and damaging their ability to replenish their numbers, meaning there are less fish available for the Tanzanians to use as a source of food or trade. While fishing is a large part of the local economy and large catches benefit fishermen in the short-term, it is creating a long-term scarcity. The same can be applied to the mangroves in the area that are harvested to build houses and burned into charred wood, or wood chips, which are sold or used to heat homes. Like sea grasses, mangroves are also potential fish habitats. But if they are overharvested, this could further disrupt the life cycles of local fish and their food webs, compounding the villages' ecological and economic problems. Additionally, Polito and Hernandez are analyzing where local fish in Tanzania fit into their ecosystem by analyzing what they eat. They analyze tissue samples taken from fish specimens and the surrounding habitats and use stable isotope analysis to determine the flow of nutrients throughout the entire food web. They take a very small piece of a fish's white tissue, a sample about the size of a fingernail, and freeze and later dehydrate it before returning with it to the U.S. for analysis. In Polito's lab at LSU, they are able to use an isotope ratio mass spectrometer (IRMS) to break the sample down into carbon and nitrogen. 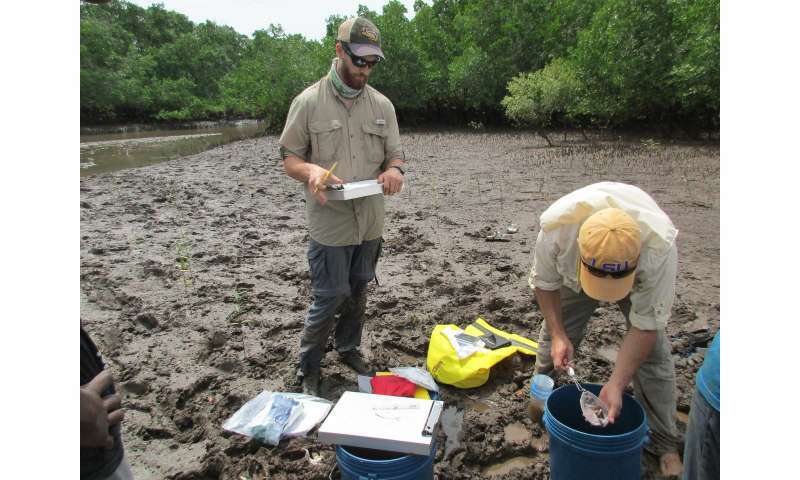 Once they have the isotope ratios of nitrogen and carbon of a fish sample, they can match the ratio to sea grass or mangrove habitats in the region. Through this process, they can identify the fish's local habitat. This information could be instrumental in helping local Tanzanians determine where to fish or harvest mangroves and where not to fish or harvest mangroves in order to best sustain local fish populations. By understanding the structural and functional attributes of the mangrove ecosystem, and its role in supporting fisheries and other vital resources, these experts are working to determine the monetary value of these mangrove systems and model how to recover and sustain them—allowing Tanzania to conserve mangroves and fisheries while also creating long-term economic stability in the region.